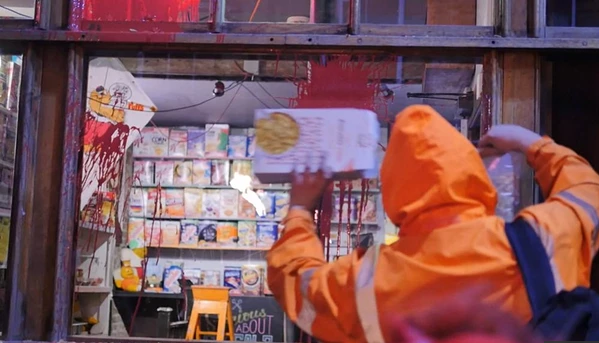 Over the last day there has been an immensely interesting conversation amongst many of my facebook friends about why I empathised with those who threw paint over Brick Lane’s cereal cafe. Many of my friends thought it was a poor choice of target and format for people’s anger. Thanks so much to all for the input. In light of this here’s my tuppence. Many friends asked why I think it is okay to target small and independent shops. In response – small or independent shops aren’t innately good. Small is not necessarily beautiful – it could be a small gun-selling shop, fur-coat shop or an independent shop selling sweatshop-made clothes – each business must be analysed on their contribution to their communities needs and a better world at large. Independent doesn’t necessarily mean ethical either – I mean Harrods is an independent store. I think that the fundamental reason for the existence of all businesses, whether small, large, independent or chains, should be premised upon the question ‘how do they positively contribute to the community”? Modern day capitalism conditions us to think we can exist as hyper individualists (thanks to Maggie’s ‘no such thing as society’), that the world is our oyster and if we work hard enough we can achieve anything we want (without questioning the impacts on others). So in order to challenge this inhumane conditioning it’s important to ask – before we do anything or set up any business – who is really benefitting? Have we asked what the community needs or just presumed (the community organising process of a ‘Listening survey’ is really useful to do this)? How do my needs relate to other people’s needs? What will be the economic, ecological, racial and social impacts of my enterprise? And fundamentally, what systems of privilege are we upholding? The concept of ‘banality of evil’ is something I live by and is also useful here i.e. how can our good intentions or even blissful ignorance be complicit in evil regimes? Asking the right questions (rather than ‘Cereal Cafe’ or ‘no Cereal Cafe’) will cultivate the curiosity which is needed to ask the right questions to change ourselves and the world into a better place. I am against all human and environmental rights violations and I stand against them all whether they are root causes (e.g. multinational corporations or the banking industry maintaining the current economic status quo) or symptoms (e.g. the Cereal Cafe). Currently the UK is the 7th richest country in the world yet the most unequal in the industrialised world. Only Portugal, the USA and Singapore do worse and the gap between rich and poor is wider now than in the times of Dickens and has the highest levels of child poverty throughout the industrialised world. Life in London and across the UK is a war on the poor. So we have to stand against inequality wherever we see it. Gentrification is a specifically oblique form of human rights violation. It’s not as easy to distinguish which side we are on as other iconic processes of exploitation. If we had to choose a side of the South African apartheid system or whether we are for or against the Iraq War, it would be much easy to draw the battle-lines. Gentrification traps you and you often don’t even know it’s happening. We all have places close to our heart. Brick Lane is the place for me, which is why I spoke up particularly about this action rather than others. I have a particular vendetta against people destroying the needs of my community here. Like many other holocaust surviving immigrants, my grandparents came to London with no money and lots of fear, trauma and need for community support. I’m honoured to live here and still be part of this incredibly spiritually and emotionally nourishing community. My grandparents worked in a textile factory near the Aldgate end of Brick Lane. I will always remember my Nan saying that she felt safe in Brick Lane as its incredible multi-culturalism was a safety net and she felt that she wouldn’t be targeted for her ethnic identity. 50 years ago it was the Jews who needed support and now it is the Bangladeshi community who are constantly a target for the British empire’s continuing racist and xenophobic abuse – both domestically (racist stop and search etc.) and internationally (the endless list of Islamophobic crimes at the hands of the British state). Whilst the community’s spaces for spiritual, emotional and practical support continue to be financially destroyed by austerity as well as many of my Bangladeshi friends’ businesses being shut down every day in the area – is the protection of the Cereal Cafe really our upmost concern? If we understand gentrification to be a process whereby people, however good their intentions, can get their foot on the ladder / up the market because of the dominant current systems of power, then we must name it. If we name these systems of power to be how racism, sexism, homophobia, ableism, age-ism, xenophobia and capitalism intersect and maintain a system whereby the power and controls of our society are largely held by white, wealthy, able-bodied, heterosexual, cis-gendered men with British citizenship – then we can understand how the marginalised are kept marginalised and why the Cereal Cafe is a insidious symptom of this. Also, gentrification doesn’t happen in a vacuum. They are not isolated incidents. Just a few weeks after the Cereal Cafe came to Brick Lane I noticed that a new shop had opened a few doors down. I joked to my boyfriend that I bet the bomber jacket in this haute couture’s shop front window was priced at about £750 when you could get an identical one on the Brick Lane Saturday flea-market for a tenner. After buzzing on their door (which they unlock if they deem you to be worthy) and asking the price of the jacket I was told it was £1250. The poorest borough in London, Tower Hamlet’s, doesn’t need £1250 embroidered bomber jackets to meet their fundamental needs of food, water, housing, security and god forbid, some semblance of dignity. Not only are these shops maintaining exploitative power structures – the normalisation of their privilege are allowing segregated processes of marketing to occur. Imagine if I was a young black Muslim boy in a hoodie? Would this haute couture shop have let me in? And who would be there to stop them? The list goes on when it comes to industries which represent dominator society – and in this instance, the Cereal Cafe. Promoting white, western, carbon-intensive, environmentally damaging value systems through internationally renowned companies (Nestle etc) which are at the forefront of human rights abuses, only adds insult to injury. Exploitation should not just be stopped at the predictable places of power (at the banks and at 10 Downing Street) but at the everyday seemingly hidden forms of subtle abuse i.e. local shops which don’t meet the needs of people and even actively keeps them away. As people who desire to make the world a more humane, equal place – we should challenge empire, and ourselves, in all it’s forms and wherever it occurs. The city of London at the heart of the reckless financial industry is like an encroaching iceberg thundering through the East End turfing any community who stands in it’s way to the curb. It’s a pattern that needs to be stopped, however trapped we feel. If we understand our humanity as individuals to be intimately connected to our neighbour (the foundations of a healthy community) we should take a step back and listen to what’s genuinely needed in the East End, before we presume that £2.50 bowls of cornflakes are the answer. But anyway, I’m no expert – come to see Sarah Schulman speak on processes of gentrification when she comes to London in mid-November at the Soho Theatre (I’ll send publicity out ASAP), it would be an honour to go there and work out what we can collectively do together – we need to.